Mediation is the process of collecting and processing usage data from networked devices, usually for billing purposes. At Mediation there are following tasks performed. 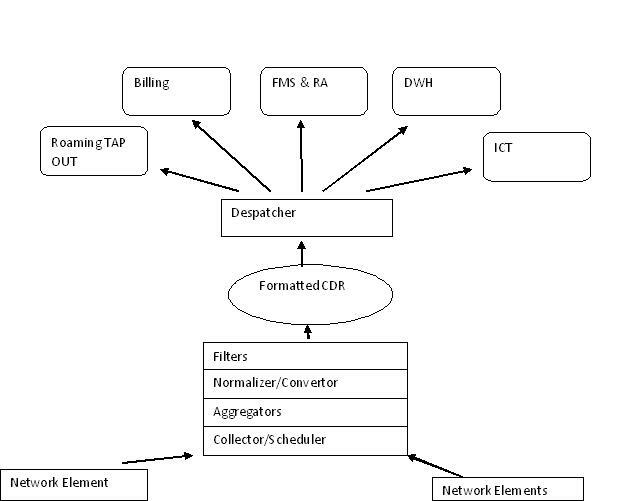 Aggregation of partial CDRs related to the same call. Transformation of data as per business logic. Whenever a Subscriber / Customer uses communication services (Voice, Call,SMS ,Data transfer etc ) from a Service Provider,Usage Data are generated at the network element. The CDRs are normally pushed to or pulled from the switches. The switch generates a CDR file. These file contains header or trailer records containing the number of CDRs in a particular file. The files are generated as they reach a specified count or at regular time intervals. There are various protocol supported namely FTP, SFTP, FTAM, X.25.SNMP.SFTP provides a secured way of collecting the CDRs as it uses SSL. Once CDR file received mediation software pre process the CDR, This process involves removal of header and trailer , adding extra filed in CDR to process and finally parsed to check with switch format to validate CDR. Some mediation software collect CDR from network element at physical path then process it, while some collect the same in buffer and after process , one final CDR is sent for further process and one file sent to Archive directory.